Milwaukee Bucks inked 25-year old Nigerian international guard Ike Nwamu (196-95kg-93, college: UNLV). Nwamu has never been drafted by the NBA. But in 2016 Sioux Falls Skyforce selected him in first round (22nd overall) in the D-League draft. He attended University of Nevada - Las Vegas and it will be his third season in pro basketball. Among other achievements Nwamu's team made it to the SoCon Tournament Semifinals in 2015. He received also Afrobasket.com All-Afrobasket Championships Honorable Mention award in 2017. Nwamu represented Nigeria at the Afrobasket Championships last year. His team won Silver and his stats at that event were 6 games: 14.5ppg, 2.7rpg, 2.5apg, FGP: 45.5%, 3PT: 47.7%, FT: 80.0%. 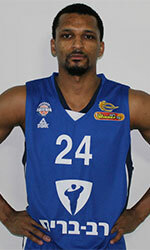 Nwamu has played previously for Lavrio.